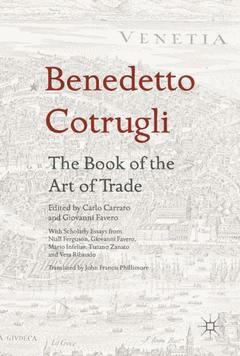 This is the first English translation of Benedetto Cotrugli's The Book of the Art of Trade, a lively account of the life of a Mediterranean merchant in the Early Renaissance, written in 1458. The book is an impassioned defense of the legitimacy of mercantile practices, and includes the first scholarly mention of double-entry bookkeeping. Its four parts focus respectively on trading techniques, from accounting to insurance, the religion of the merchant, his public life, and family matters. Originally handwritten, the book was printed in 1573 in Venice in an abridged and revised version. This new translation makes reference to the new critical edition, based on an earlier manuscript that has only recently been discovered. With scholarly essays placing Cotrugli's work into historical context and highlighting key themes, this volume is an important contribution to our understanding of the origins of management and trade practices. Carlo Carraro is Professor of Economics at Ca’Foscari University, Venice, Italy. He was President of the University of Venice from 2009 to 2014 and Director of the Department of Economics from 2005-2008. Carraro is Scientific Director of the Fondazione Eni Enrico Mattei and Director of the International Centre for Climate Governance (ICCG). He is also President Elect of the European Association of Environmental and Resource Economists (EAERE), Co-Chair of the Green Growth Knowledge Platform Advisory Committee and the Editor of the Review of Environmental Economics and Policy. Giovanni Favero is Associate Professor of Economic history at the Ca’ Foscari University, Venice, Italy, in the Department of Management, where he is Deputy Dean for Research. His research interests focus on the history of quantification, from statistics to accounting, and business history in a long-term perspective.